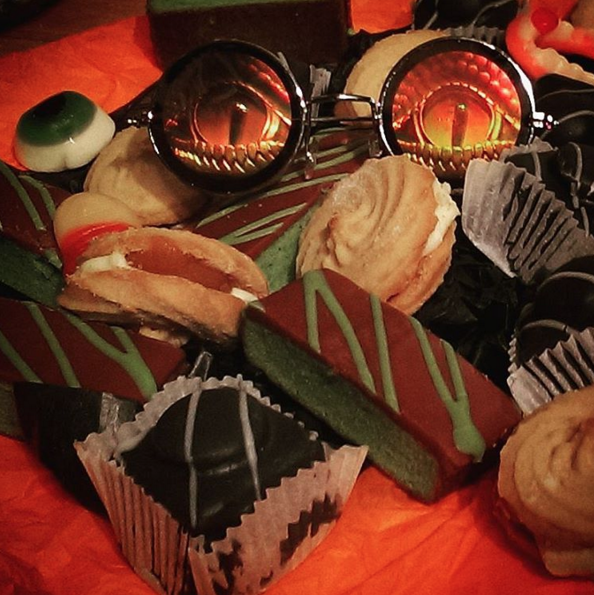 We don’t do Trick or Treating – we never have. 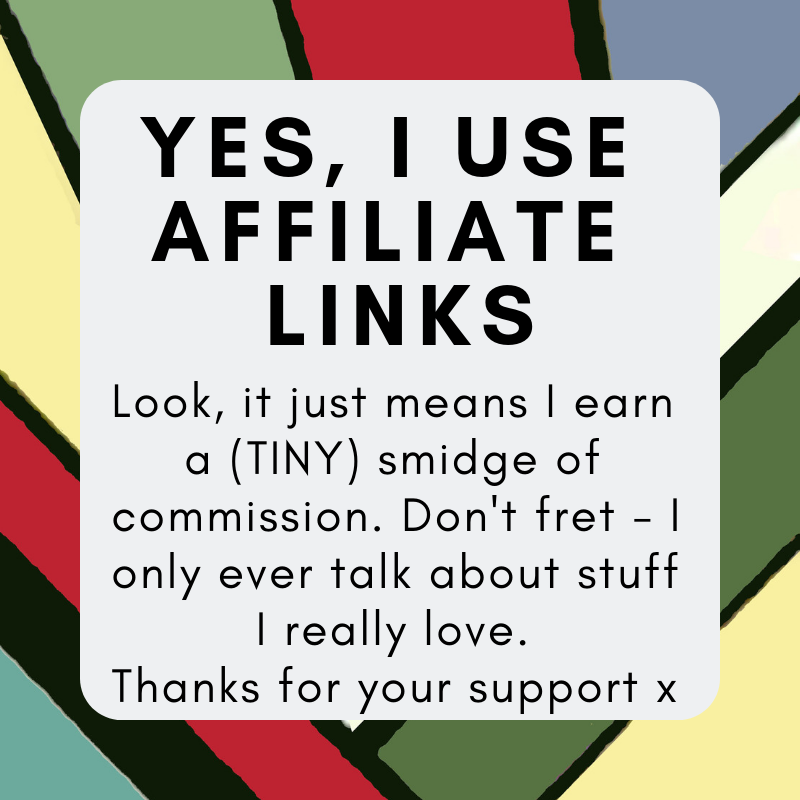 It’s a new thing that neither myself or Mr LittleStuff grew up doing, and it juts never sat right with me that I would take my children out to knock on a strangers door and expect sweets. I’m not morally opposed, I’m not hugely anti… it’s just not the way we ‘do’ Halloween. 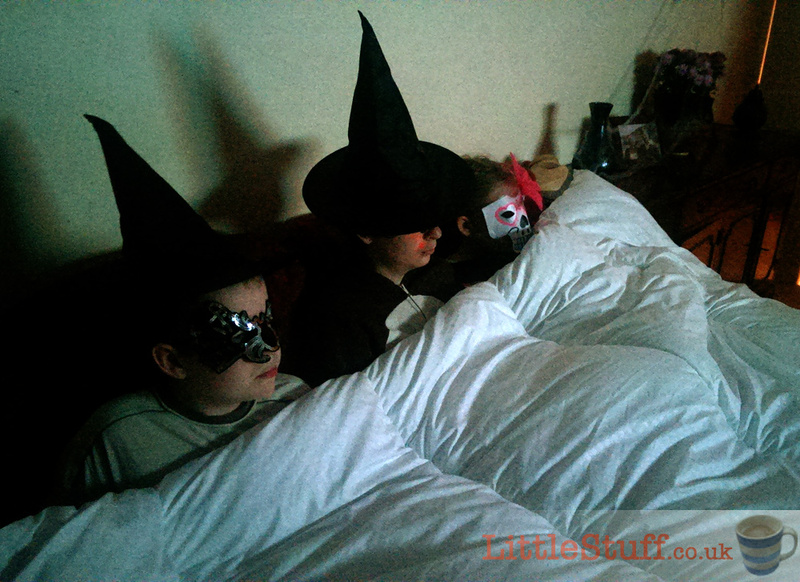 Instead, we tend to do what i did as a kid, and enjoy a Halloween party – traditional (silly) games, scary food etc. Some years we’ve gone to friends, some years we’ve had friends over… this year it was just us. Makes no difference – any excuse for a bit of fun. Things always start the day before when Mr littleStuff sets up his Pumpkin Carving station. In previous years the children have scooped the innards out, drawn their designs on in marker pen, and he’s carved for them. But this year he was determined they would carve as much as possible themselves. Consequently, their designs got more dramatic! Top left is Olaf, designed for 8yr old Bear, obviously. 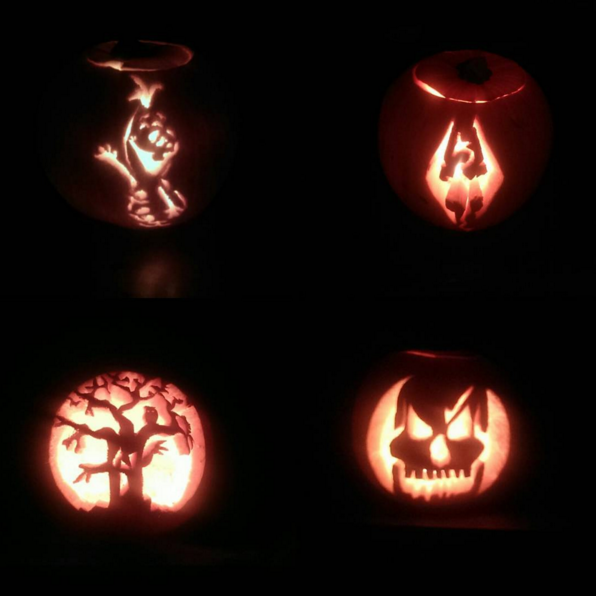 Boy at 14 went for a Skyrim dragon motif, and Jolly (12) opted for a traditional scary face bottom right. Bottom left is ‘my’ pumpkin – every year Mr LittleStuff surprises me with something special – and this owl in a tree was so beautiful I wanted to keep it lit and flickering in the house all winter. 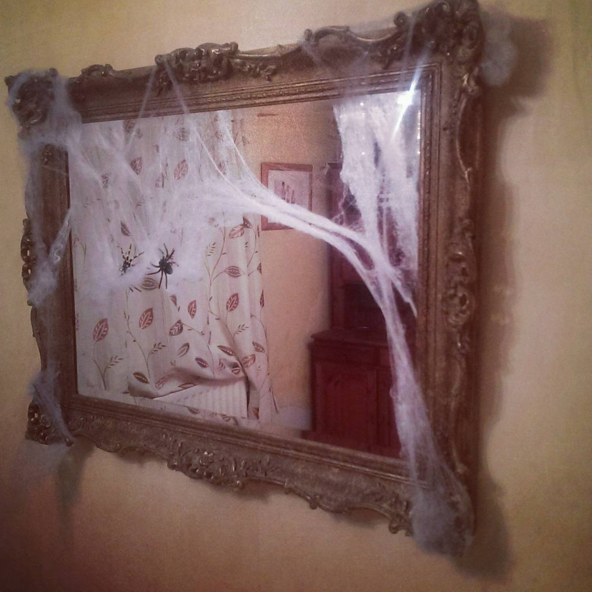 Before the party got going, Mr LittleStuff started with the fake cobwebs – it looked awesome. SO effective. 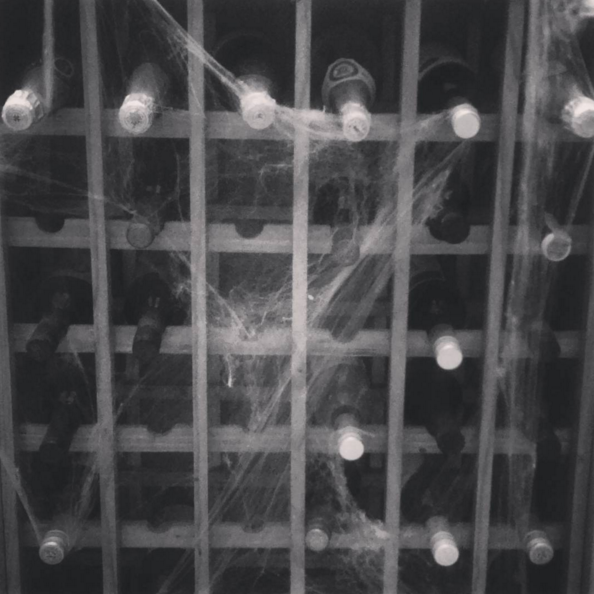 Although the fact that I couldn’t actually touch the wine rack is never a good thing, is it (and yes they are fave – even I, the non-house-cleaner, don’t let it get that dusty, honest)? Once we were set, the lights turned low, and the silly games began. 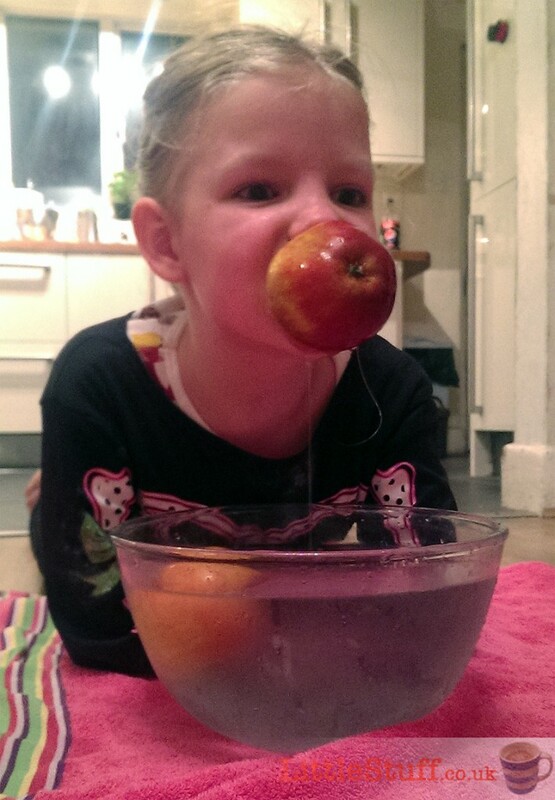 We had the flour cake game, apple bobbing (no one wanted to go down the bottom of the garden for a bucket, so we bobbed in a mixing bowl instead. Totally worked…), eating doughnuts off a string, sleeping ghosts, What’s the Time Mr Vampire… loads of silly family favourites that they never seem to grow out of, no matter how big and teenagery they get. Thanks Mr Kipling, the cakes were exceedingly good. I especially loved the black french fancies! Finally, it was time to settle down for the Halloween Movie – this year’s selected viewing was a classic Bette Middler in Hocus Pocus. I couldn’t believe they’d never seen it! The duvet was gorgeous and caused much ooh-ing as it floated round them – supersoft to touch it gently wraps around you and feels deeply cosy. It’s surprisingly lightweight, even at 10.5 tog, and the silky microfibre outer is wonderfully soft and cool to touch. It’s non allergenic, obviously, machine washable at 40° and you can put it in the tumble dryer. Plus it’s made in the UK. The Slumberdown Sleepwell Luxury Stripe duvet starts at £17 for a single – our Kingsize version is just £38, and a total bargain.